What exactly is a BJJ Gi? When getting into Brazilian Jiu Jitsu the BJJ gi becomes an essential part to any fighter. This is made from the uniform commonly used in Japanese martial arts.Gi is known to be made of reinforced trousers and heavy cotton jacket. There are two main factors for the belt worn in BJJ. When wearing your gi the cloth made belt is worn over it to keep the jacket closed as well as a signifier of the rank/skill of the practitioner. In Brazilian Jiu Jitsu the Gi is the most important gear for professionals, hobbyist, and amateurs all alike. In today's world the Gi symbolizes honor, pride and one's personality just like the Samurais back in the day. The best BJJ Gi differs from the well known uniforms used in common martial arts like Judo or Karate. It is made very durable as well as tough and should be made to handle mass amount of pulling and tugging without tearing apart. A Taekwondo or Karate uniform would not be able to handle all the gripping and more than likely tear off after only the first session. Our top quality and Viking Tough manufacturing create a Gi that is reinforced with extra stitching to make a top selling and long lasting Gi. Currently we even have a bjj gi sale! Come see our list of cheap bjj gi for yourself here. For international championships the permissible colors are typically black, blue and white. Some jurisdictions are more relaxed allowing any single solid color as long as the pants and top are the same color. Many places require it customary for practitioners to wear only a white belt if they are in fact a white belt, however, once a blue belt is obtained they are then allowed to wear any color of choice. 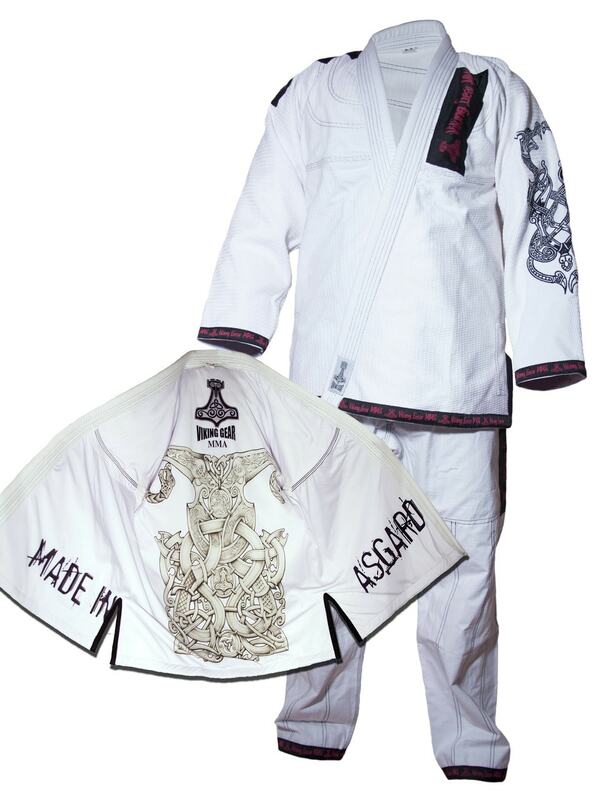 The Asgard Warrior Gi is a Gi made with professional quality. 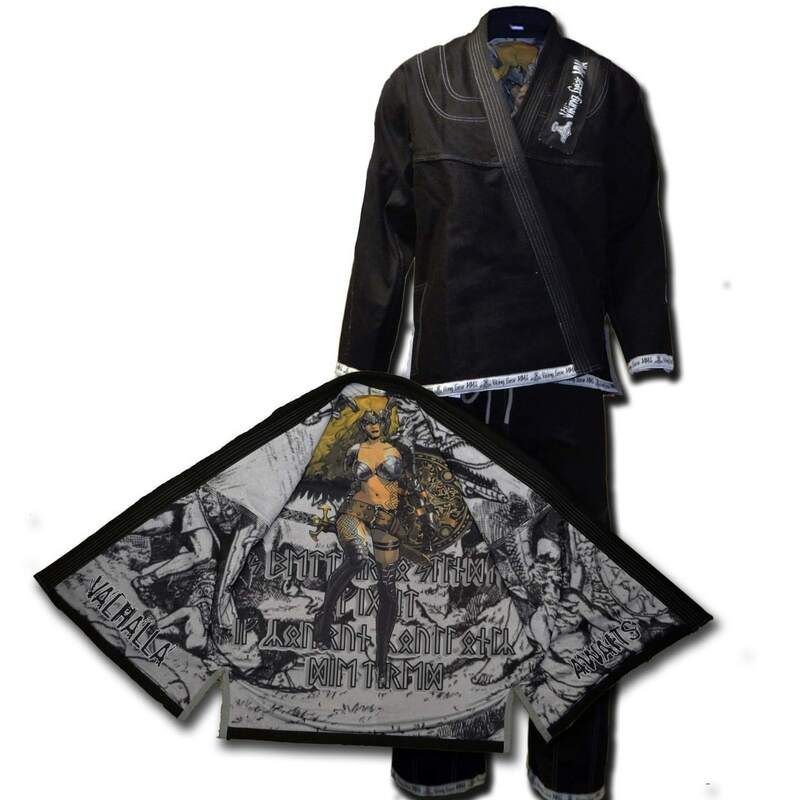 This specific BJJ Gi is a limited addition for a very low amateur price. It is made 550 gms and 100% cotton Gold Weave fabric with black reinforced stitching making it more durable than a single weave without the extra weight. Both the pants and jacket have durable double/triple stitched seams to have you ready for your conquest for longer than most other gi manufactures. The pants are ripstop meaning they are used with a special reinforced technique that makes them even more resistant to ripping and tearing. In the weaving process there are interwoven threads in regular intervals in a crosshatch pattern. This Gi also has pants that has reinforced knees doubled down to the lower hem. The inner lining is an intricate design which has a sublimated image that will never cease to keep its amazing look. The front is a tailored multi-piece with a single back paneling. This Gi is perfect for any type of practitioner in Brazilian Jiu Jitsu. There are no other competitors that can close to the quality and look of our Gi that’s why these will be flying off the shelves so get them while in stock. 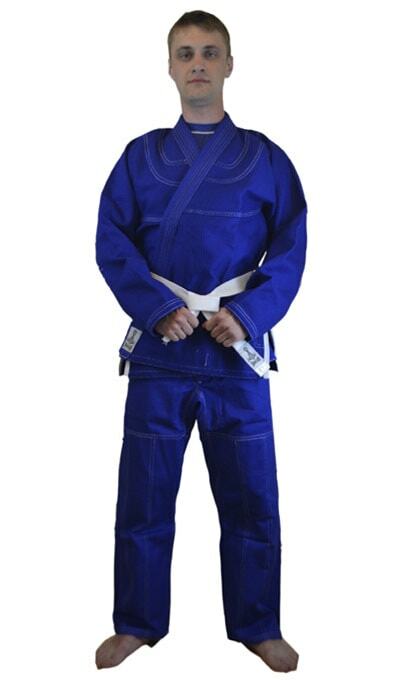 The Blue Gi Gold Weave is another high quality Gi being sold at a very amateur price. The best part about this Gi is that it has free shipping as well! The Gi is made with a gold weave that is 550 gm giving it durable quality compared to a single weave Gi without the heavy weight. It has a clean high-end design with no patches. This BJJ Gi is ideal for competition or everyday basic BJJ use. It’s pants and jacket are made with reinforced double/triple stitched seams. This Gi also has pants that has reinforced knees doubled down to the lower hem.The Blue Gi Gold Weave is also tailored with a single back paneling and a multi-piece front. Another great quality about Viking Gear is that with this Gi you get a free white BJJ belt. Compared to other competitors like Hayabusa, Atama, and Vulkan this is a steal of a price. If you are looking for wholesale pricing we do offer a wholesale program where you can get this BJJ Gi for an even cheaper price. Only the boldest and bravest warriors are selected by The Valkyrie to go to battle, will you be one of them? The Call of The Valkyrie is a premium Gi made with only the best quality material. Our premium collections of Gis spares no expense in giving you the best in the industry. This Gi is made with amazing detail like our exterior grey stitching that contours against the black of this particular Gi. The internal make of the Call of The Valkyrie Gi is made with the same material that the rashguard is made of making it one of the most comfortable gi to role around in. This BJJ Gi is made for any type of practitioner and is nothing like what other competitors try to promise. It is made with 100 cotton Pearl Weave made with 550 gm black fabric. It is made with a single back paneling and multi-piece front. Rip stop pants that give extra support when rolling. This BJJ Gi is also covered by our Viking Tough Warranty! On our Dark Side we give free shipping! The Dark Side Gi not only has free shipping but many other qualities that make it irresistible. It has the same high quality as any other one of our gis for the same amateur price. It is 550 gm 100% cotton Gold Weave fabric. This makes it longer lasting and stronger without unnecessary added weight of most double weave gis. Both the pants and jacket are reinforced with double/triple stitched seams. This also has no patches with a clean high end design. 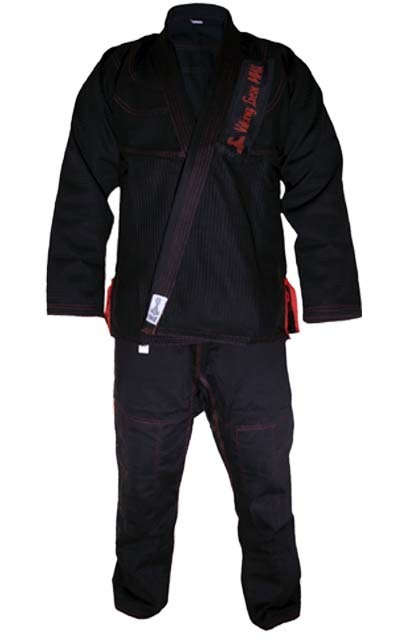 This black bjj Gi has a single back paneling and a tailored multi-piece front. It has reinforced knees doubled all the down to the lower hem. If you are looking for an even lower price then what its already marked at looking into our wholesale program where we have it at wholesale pricing which is an even cheaper price. Like Fenrir, you can not be held by any bond! Fenrir a fierce and ferocious wolf is what is portrayed on the inside of the jacket of this BJJ GI. This limited edition Fenrir Master Gi comes in gray with a blue stitching to create a beautiful contras. There is writing on the Gi sides stating, “If you cannot bite, never show your teeth.” While written on the back is the story of Fenrir. This is a favorite of all practitioners of BJJ alike. It has the same durability as our others with the 550 gm 100% cotton Gold Weave fabric. Both the jacket and pants are reinforced with extra stitching. The Fenrir Master Gi is made with a multi-piece front and a single back paneling. Pants are reinforced knees doubled down to the lower hem. 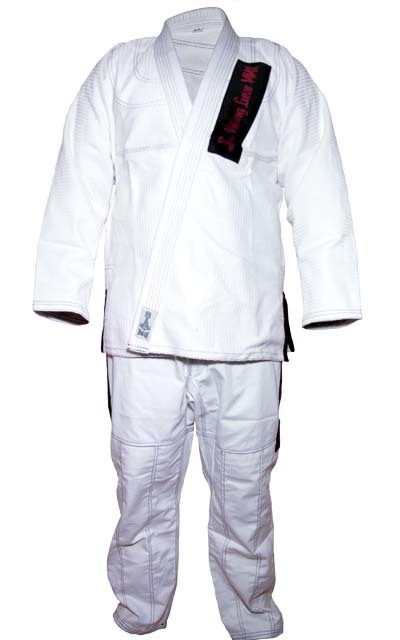 The White Gold Weave Gi is made with 550 gms and 100% cotton Gold Weave fabric. It is also detailed with black stitching. This specific type of weave is stronger and longer lasting than a single weave and the best part is it does not come with unnecessary added weight of most double weave. This is ideal for basic everyday use or competition with its clean high-end design and no added patches. Like our other Gis the pants and jacket have reinforced stitched seams. As well as having a single back paneling and multi-piece front. Get them while you can especially because we are giving away a free mouth guard with each purchase. You can also get this at an even cheaper price when bought through our wholesale program. For the female warriors out there this women’s bjj gi is perfect! For Viking Gear this is one of the best selling BJJ Gi designs we yet to make and comes with free shipping.The limited edition Girl Power Pink Gi is gorgeously designed with black stitching to help create a beautiful contras. It is made with the Pear Weave that is 550 gm. This makes this Gi tougher without the annoying added weight of most double weave. The pants are specially designed with rip stop manufacturing. Both the pants and jacket are made with extra strong stitched seams. It is made with multi-piece front and single back paneling and a clean design with no patches. Compared to other competitors like Hayabusa, Atama, and Vulkan it is going for an insanely cheap price and can also be found at a cheaper price through our wholesale program. Get it today and know you are not only helping yourself but others. With the purchase of the Gi portions of the proceeds will go to Breast Cancer Awareness.